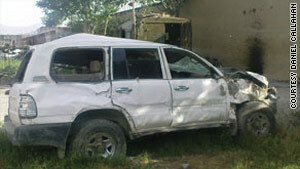 This vehicle driven by a contractor was hit in Kabul, Afghanistan, in May, leading to a deadly shooting. Washington (CNN) -- Two men who worked as security contractors for the company formerly known as Blackwater have been charged with murder in the killings of two Afghan men, federal prosecutors announced Thursday. Christopher Drotleff and Justin Cannon are charged with two counts of second-degree murder and one count of attempted murder each in connection with the May shootings in Kabul. The 12-count, 19-page indictment returned by a federal grand jury in U.S. District Court for the Eastern District of Virginia also includes weapons charges against the two men. The indictment was returned Wednesday but unsealed Thursday. Both men were in Afghanistan working for the security company Paravant, a subsidiary of Xe, the military contracting firm formerly known as Blackwater Worldwide. FBI agents have arrested both men, the Justice Department announced. Drotleff, Cannon and two other contractors, Steven McClain and Armando Hamid, were involved in the May 5, 2009, shooting that left two Afghan civilians dead and another wounded. The men had been hired by Paravant to help the U.S. Army train Afghan troops. The contractors said they were driving their interpreters on a busy Kabul street called Jalalabad Road at around 9 p.m. when a car slammed into one of their two cars. "I immediately thought we were under attack," McClain said in May. The contractors got out to help their colleagues, and the vehicle that had struck the car did a U-turn and headed back at them, the men said. The contractors fired at the oncoming vehicle. "The car was coming at us," Cannon said in May. "At that point we attempted to stop and immobilize the vehicle and we engaged it in small arms fire. And the car didn't stop, it just kept going." The incident spotlights the issue of the role and conduct of U.S. security contractors in Afghanistan. A similar issue arose in Iraq after a September 2007 confrontation involving then-Blackwater contractors that left 17 Iraqi civilians dead. Blackwater lost its contract there after Iraq's government refused to renew its operating license. The company then changed its name to Xe, and it continues to receive multimillion-dollar contracts in Afghanistan. In the wake of the shooting, all four men lost their jobs with Paravant for violating the company's alcohol policy. The contractors said they had not been drinking and had not had a drink since their arrival in November. "We feel that Blackwater wanted to shift the blame from Blackwater itself to these men as if they were acting on a lark," attorney Daniel J. Callahan said in May. "Off duty, with weapons, weapons of their own, and while drinking. And I think the intent is to use these men as scapegoats." Callahan, who has advised the men but has not been formally retained by any of them, did not immediately return a call Thursday seeking comment on the charges. In a written statement Thursday, Xe said it had "immediately and fully cooperated with the government's investigation of this tragic incident and terminated the individuals involved for violating company policy." Also Thursday, Xe announced it has settled seven lawsuits that accused it of crimes in cases not related to the Afghanistan shooting. The lawsuits accused Blackwater security guards of widespread illegal activity, including fostering "a culture of lawlessness" among its guards. A lawyer representing the plaintiffs, Susan Burke, said neither she nor anyone else involved in the settlement was allowed to discuss it publicly. It was not clear how much the settlement was for. One lawsuit, filed by Burke in 2007 on behalf of families of several Iraqis killed or wounded in the September 2007 shooting in Baghdad, Iraq, said that a quarter of Blackwater security guards in Iraq use steroids and other "judgment-altering substances." The lawsuit also accused the company of war crimes, wrongful death, assault, negligent hiring and emotional distress. The plaintiffs included two wounded survivors of the Baghdad shooting and the families of five people killed in the incident. Blackwater denied the accusations. Last week, a federal judge dismissed manslaughter charges against five Blackwater security guards involved in the killings, finding that prosecutors wrongly used the men's own statements against them.